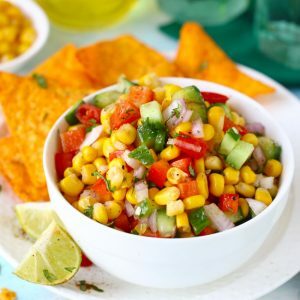 Corn Salsa Recipe | How to Make delicious Corn Salsa ? 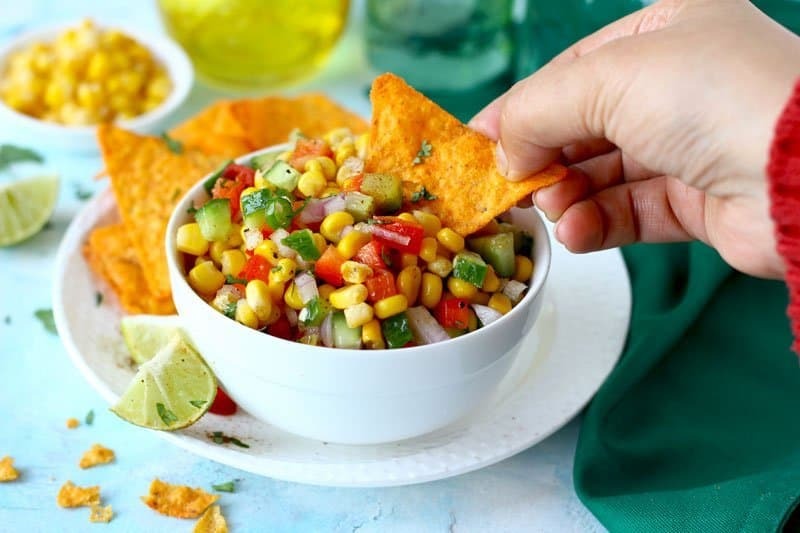 This Corn Salsa is everything I love – sweet, savory, spicy, crunchy and fresh. It’s gratifying with nachos or inside the tacos. Perfect any way you serve it – you really can’t go wrong. The best part about this Corn Salsa Recipe is it takes less than 30 minutes to get ready. 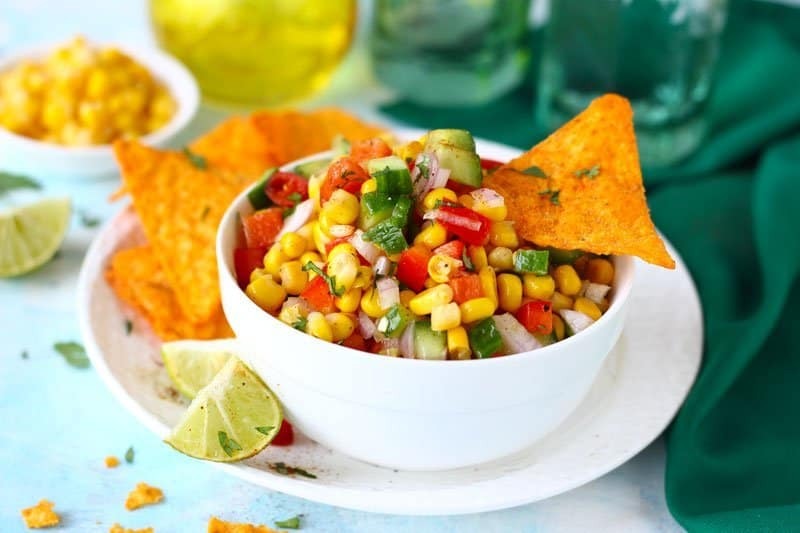 So to welcome the announced guests on a Friday night – quickly stir up corn salsa and serve it with nachos. Delicious, fuss-free snack is ready in no time! No need to spend hours in the kitchen on planning for a lip-smacking condiment to accompany the munchies. You will be surprised to know that this corn salsa is healthy, vegan and gluten-free too. Anything with plenty of corn kernels in it is my favorite. I love the sweetness of corn kernels. So I never miss a chance to sneak them in few of my beloved dishes – Corn and Besan Cheela, Corn and Paneer Tikki and Corn Cheese Muffins. 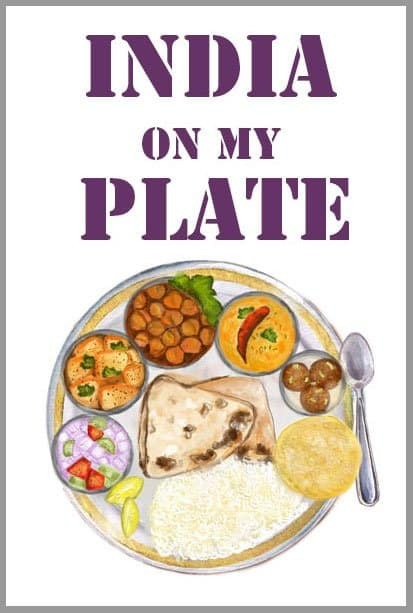 All of these dishes are few of the most popular recipes on my blog. It reflects how much we all enjoy cooking with corn kernels on a routine basis. Now with this corn salsa recipe in hand, you will have one more reason to use the corn kernels more deliciously. If you are in a grilling mood then use corn on the cob for this corn salsa recipe. Grill the whole corn on the cob, remove the charred corn kernels and use them to make the salsa. Ohh man, they taste super smokey and tasty in the salsa. During the summer season, the heat in India is not appealing at all to bring out the grill. Hence, I have used tinned corn kernels for this recipe. Blanch the corn kernels for a minute or so in the boiling water, drain and allow to cool. They are ready in few minutes to make salsa. But I must confess that grilled corn kernels give a unique dimension of taste to this corn salsa. On a busy weekday, I quickly combine vegetables with the corn kernels and enjoy it as wholesome and hearty lunch. We call it a corn salsa salad. 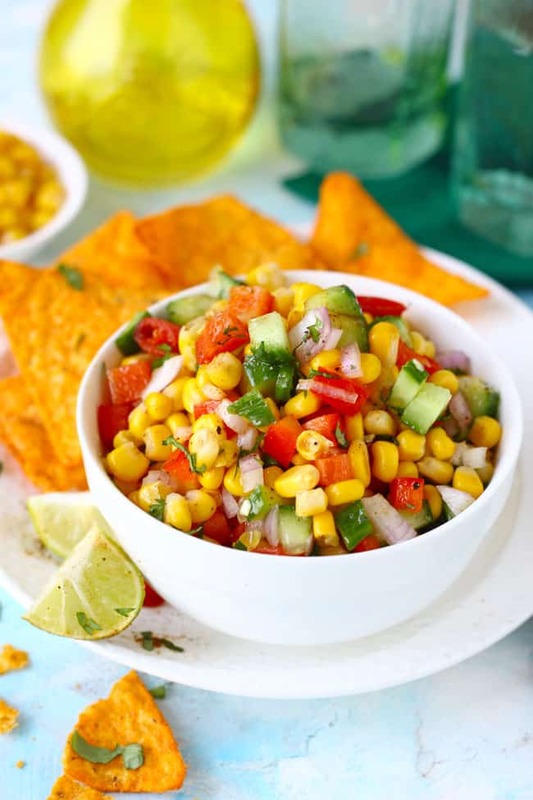 And this corn salsa salad makes an excellent, fulfilling lunchbox for kids and the adults. Pack some munchies on the side and an exciting looking, colorful meal for the lunchbox is ready in less than 30 minutes. Who would not like to bookmark such a life-saving recipe? I definitely need to do that. This Corn Salsa is everything I love – sweet, savory, spicy, crunchy and fresh. If you are using fresh corn kernels either boil them for 3 - 5 minutes. Strain in a colander and allow to cool. Chop all the vegetables and herbs for the salsa. In a mixing bowl combine the corn kernels, vegetables, chili and coriander. Add lemon juice, salt, pepper, olive oil and red paprika. Mix nicely, taste and adjust the seasoning accordingly. Keep in the fridge for atleast 30 minutes before serving for the flavors to develop. Serve Corn Salsa with nachos for snacks. Looks like summertime in a bowl. I can taste it now, sitting by the pool with a margarita nearby. Cannot wait to try this! This is so gud, ingredients are also easily available . Thanks for sharing .